I am going to try to get this all down without sounding really vain and self centered and pathetic, so bear with me. Hell, I'm probably going to sound vain and self centered and pathetic, so deal with it. It is my experience, after all! Okay so...recap...in late May I got a voicemail message on my cell phone from Weight Watchers dot com. A woman asked me if I was still interested in being a Weight Watchers success story, and if I was to give her a call. So...I called and she called and we played phone tag for awhile. Long story short, Weight Watchers flew me to New York City for three fun filled days and two fabulous nights to participate in two activities; a round table discussion with other ladies who had lost weight on Weight Watchers for one (or more) articles to go onto the website related to body image and weight loss, and a photoshoot for a success story. 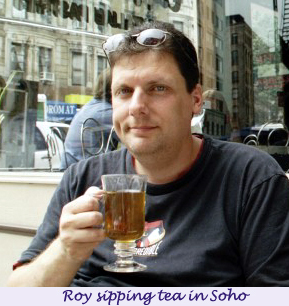 Since Roy and I are attached at the hip, I arranged for him to come with me. The travel agent booked our tickets and hotel for us (WWers paid for my plane and the hotel and other travel expenses). 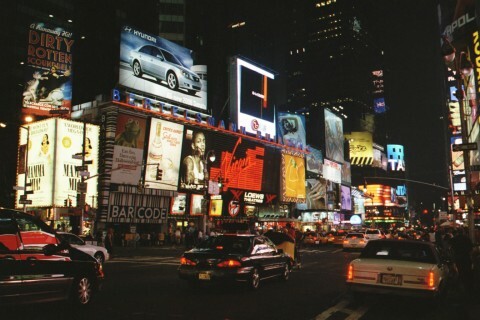 We got into our hotel at about 6:00, checked in, and dropped our bags and headed straight to Times Square. Since we hadn’t run that day we made it a “run” which was really more of a brisk walk, wait, run into people, etc. It was about 2.5 miles from the hotel to downtown so we got there about 7:00 and Roy wanted to buy tickets to a play right away. I hadn’t eaten since breakfast so I was ready to veto that idea, but the lure of a play was too much. We grabbed a pretzel from a street vendor and a Tasti Delite (the food of the gods) and tickets to see “Dirty Rotten Scoundrels.” IT WAS AWESOME!!! We had so much fun. After the play we waited (like geeks) outside the stage door and gathered autographs from John Lithgow and Norbert Leo Butz (yes, real name) and the other actors. After the play we made our way back to Times Square and had a salad at McDonalds, people watched for awhile, then took a cab back to the hotel. Thursday morning we got up bright and early…or rather, overcast and early to go for a run. We decided to run from our hotel on East 24th to the park (Central Park). BIG mistake! First of all it was hot and muggy out; already about 75. Hot and muggy isn’t fun to run in, but we can handle it. Hot and muggy, though, has an amazing impact on the smells of the city. OMG! NYC is the stinkiest city on the face of the earth! I won’t even go into it. Suffice to say there were a few times that I literally thought I might lose my granola bar. We got to the park and ran through the (closed) Central Park zoo then ran back to the hotel for a total of, we estimated, about six miles. We decided that Friday we would get up and take the subway to the park and then run in the park, where the smells were much more palatable. After our showers we headed down to Times Square. Talk about earning your APs! We really did on this short trip. LOTS of walking and running. 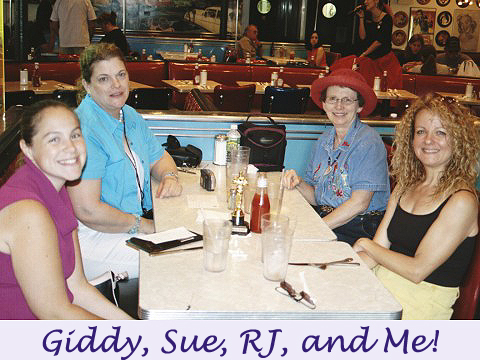 We did a little poking around and then met some friends from The Pointers email list; Sue, Andrea (Giddy), and RJ, at Ellen’s Stardust Diner. This place is fun. The waitstaff sings throughout the entire meal in a kitschy, 1950s, goofy atmosphere. The food is good, the company was fine, and the entertainment outstanding. We chatted and ate and avoided the fries and asked for our dressings on the side. It was so fun meeting people I'd only emailed previously. We all got along like old friends and Sue and RJ presented me with my "award" (at the right). It says "A Star is Born" and has a revered place in my office where I can remember how much my friends mean to me any time I need a boost. I only wish we'd had more time to just sit and talk! After lunch we went directly, without passing Go, to Tasti Delite and indulged in 10 calorie an ounce “ice cream” and walked around a bit and talked. Giddy had to head back to work, so Sue, RJ, Roy and I kept walking and talking. Sue left next and we went with RJ to Bryant Park to see the Broadway in the Park performance. We missed the beginning, but did get to see the principals from Beauty and the Beast do four songs, and the Altar Boyz do four as well. They were GREAT! By now the humidity was down and the sun was out and the garbage had been picked up, so the day was looking up all the way around! After music in the park we headed to a photography museum. Roy bowed out so RJ and I went inside and looked at some cool pictures. I particularly liked the daguerreotypes. It was interesting, but too soon I had to head to my first official activity as a success story. We bid RJ goodbye and headed back to the Weight Watchers building on 11th and Madison. We were earlier than anticipated so we sat in the park and talked and people watched for a bit. At 4:20 or so I was let into the building and went upstairs. I met Liz, the lady I’d been corresponding with for awhile. We hugged like old friends. I was the second to arrive. Audrey, another success story, was already there. After awhile two more success stories came in and we all sat around the table with the writer, the web designer, a nutritionist, and Liz. We were going to have a round table discussion about body image. It was VERY interesting. They asked us questions and we responded, then broke off into other areas. It was like a long “Oprah” type conversation. It was moderated to some extent, but very honest and free flowing. There were a lot of differences, but also a lot of similarities among the four of us, and later five. Another success story joined us after her photo shoot. I had lost the most weight, with two other women who had lost 90-95 pounds. The other two had lost 50-55 pounds. But we all shared a great deal in common related to how we see ourselves now, the struggles we had with our body images, the adjustments we have gone through and are still going through as we deal with being “new” people. We talked about the empowerment that came with meeting our goals. The interesting thing is, while none of us would deny that we liked the way we looked a lot better, all of us talked about the health benefits. In fact that came up time and time again. The lady from California is a gym nut much like me. We talked about how good it felt to be able to move and work out and meet physical goals. We talked about the feeling of taking control of our health. It was an awesome, nearly two-hour long discussion! Apparently the round table will be turned into one or more articles that should show up on weightwatchers.com in the future. After the round table Roy and I once hot footed it to Times Square. Again we had very little time before the play so dinner was Tasti DeLite and another pretzel. Hey, at least it’s point friendly! Besides, I wasn’t really that hungry. Spamalot was HILARIOUS! We knew it would be, but wow…what fun! Our seats weren’t nearly as good as the night before. Somehow for Scoundrels we scored fourth row, half price tix. We paid full for Spamalot to sit in the very back row. Who cares? We got to see Tim Curry, Steve the Pirate (from Dodge Ball), and David Hyde Pierce gallivant around on stage in tights! 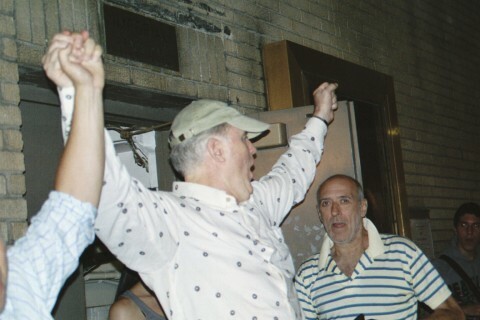 After the show we once again waited outside the stage door and gathered photos and autographs. 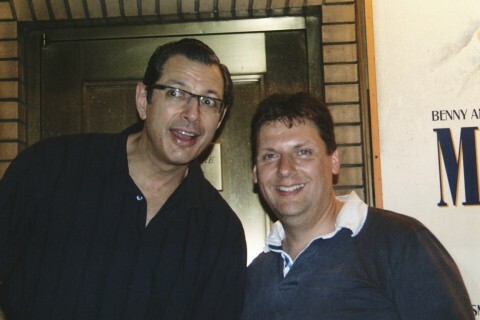 At the same time Spamalot let out, Pillowman also let out in the same building so Roy went over to get a picture with Jeff Goldblum. I would have loved to have seen that play. Friday dawned once again murky and early, but this time we didn’t dare run through the city. Instead we took the subway to near Central Park and ran around Central Park. That was really cool! I mean you hear about Central Park, you see pictures, and now you’re running through it with other runners! LOVED IT! Did NOT love the muggy heat, but what are you going to do? We decided to run about five miles then walk back to the hotel, stopping at Starbucks for coffee on the way. We were an hour early so we decided to find someplace to sit and get a coffee or something. The studio was literally on Broome smack between Chinatown and Little Italy. On one side of the street there were all sorts of Asian languages being spoken, on the other side it was like walking into an episode of the Sopranos. We found a place with passable coffee and good, fresh biscotti and sat outside for a bit waiting for the time to show up. Roy walked me into the building and said goodbye. I really wanted him to come up and take pictures, but he was afraid he’d get in the way, so instead he took back off towards Times Square on the subway and I headed up to the shoot. I got up there and met Liz and another lady (Laura?) and Luciana Pampalone (the photographer). Laura took me up for a wardrobe fitting. I was wearing a short denim skirt and button up white shirt. They asked me to show them what I brought as we’d been asked to bring some clothing that we might feel comfortable being photographed in. I showed them my jeans and leather pants, but they decided that I had such great leg (blush) that they should really keep me in skirts. We tried on a few outfits, including one that I felt was very “Carrie Bradshaw” (not like “weird” CB, but cute and flirty CB). We decided I’d go with my denim skirt I had worn in and a pink cami with a sheer blouse for the first set of photos, and the “Carrie” outfit for the second. This was a pink cami, swingy pink and grey mid-length skirt, and a cashmere sweater that tied around my waist with Pamela’s necklace as an accessory. After the clothing was selected I was sent back downstairs for hair and makeup. The studio was a large-ish white loft with very clean and classy lines. It had a small kitchen and a bedroom upstairs. Luciana lives and works in the space and it was really funky looking, like something out of a movie. I was introduced to Stefano, the hair dresser. He was so cute! Thick accent, all full of “Darlings” and “Beautifuls” and “Loves”. I had worn my hair curly so we decided to go with the curly look. He spent about 30 minutes defining my mop into something that actually appeared to be classy! It was so cute. I’m going to try to reproduce the style, but maybe taking a lot less time. Who has 30 minutes just for hair? 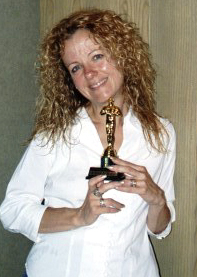 Then one to Pamela, the makeup artist. We talked about what I should do with my makeup and she spent about 20 minutes dolling me all up. I have to say she did an excellent job. I worried I’d look over coiffed and over-done, but both of them did an excellent job making me look pretty and natural. Back upstairs for my first outfit, then back down for the photos. They put me in front of a large white background with bright lights and reflective screens. Wow! It was like a REAL photoshoot!! For the next hour I smiled, and held up my arm, tilted my head, thrust my hip, etc. There were stops for hair fixes and makeup repair. Seriously, I felt like a celebrity! People kept telling me how beautiful I was and what great legs I had…enough with the legs, already!! They used these magical words that I never thought would be applied to me like “tiny” and “flat tummy” and “cute little figure” and “legs like a teenager.” Even when I was a teenager I didn’t have legs like a teenager! It’s no wonder celebs get such big egos! Stefano would come up to me and pouf up my hair, touch my face, and say “Beautiful dahling…pehfect!” I got to see some of the pictures and okay, this is going to sound like bragging, but DAYUM! They looked GREAT! Seriously! I don’t know how they did it, but I swear I looked like a real model! About 200 shots, four hair fixes, two wardrobe changes, and six face powders later it was over. It was so much fun! I figured it was like the skydiving adventure; I would probably never do it again so I planned to keep my eyes open, my mind free, and just experience it! That’s what I did. I just enjoyed the fawning, smiled big, tried to hold in my tummy, and had a great time experiencing this surreal moment in my life. After changing back into my own clothing, doing a quick weigh in (118.5, which was fine considering it was late afternoon and I had clothes on) and bidding everyone goodbye, I met Roy out on the street below and we walked through SOHO (to a much nicer area), grabbed another pretzel (I heart pretzels), and eventually grabbed the subway back to the airport. We arrived back in Burbank at 9:40 p.m. on Friday night, exhausted but filled to the brim with wonderful memories! To the left is a picture of me after the photoshoot. I love what Stefano did with my hair and what Pamela did with the makeup. I can't wait to see actual pictures from the shoot itself. Weight Watchers has called a few times since then to do telephone interviews. I will okay the final story and then it'll be six months to a year (so maybe next summer) before it's published. It was such an exciting experience, and definitely one I'll never have again! I just feel so fortunate to have been a part of it!